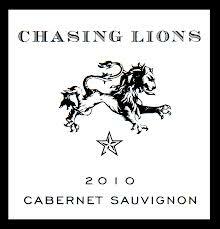 The final bottle of our Chasing Lions 2010 Cabernet Sauvignon, North Coast, shipment brought a wistful smile to my face as we pulled its cork. Lions had a good run for our family, and it will for yours too. For us, it accompanied pepperoni pizza on this occasion and has worked well with steaks and the like with previous bottles. As with previous tastings, you get the initial impression of cherry/berry and some dark hint of something…in reading about an Amarone today I encountered the description “fresh leather” but that’s not quite the right fit for the earthiness here in the Chasing Lions 2010. It’s got a pleasant smell and an easy finish. Unless you’re prone to heartburn, you’ll find the Lions a simple, delicious complement to your grilled meat. We have a couple of great Pinot Noirs and Bordeauxs from which to select but tonight the Cabernet Sauvignon was the right move. This entry was posted in Cabernet Sauvignon and tagged california winemaking, USA.